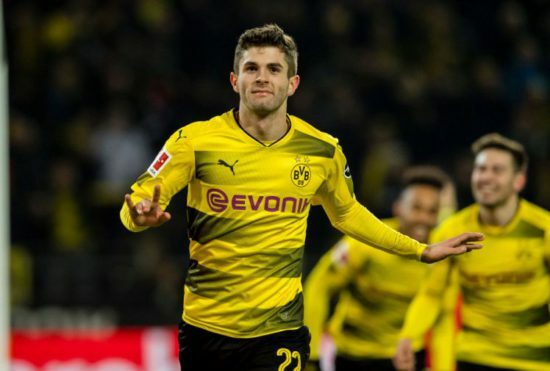 Chelsea owner Roman Abramovich is busy in the transfer window as he holds talk for the signing of Borussia Dortmund’s winger Christian Pulisic. Reports states that Abramovich landed Antibes on Saturday to meet with Chelsea’s director Marina Granovskaia for a discussion about the club’s transfer plans as the transfer window deadline draws closer. With a new manager onboard, the club owner and his director hope to help coach Maurizio Sarri improve his squad strength as they help to secure some players for the club. According to reports from Mail on Sunday, Abramovich met with Dortmund officials and talks for a possible transfer of the 19-year old winger has begun after recently signing Jorginho. Pulisic joined German club Borussia Dortmund at the age of 16 and has established himself as a first-team regular at Dortmund. His low center of gravity allows him to dribble even at high speeds and recently, he plays more of a winger role than attacking midfielder for Dortmund. Although, because of his playing style, he has been subject to fouls by his opponents. If the Blues closes the deal and bring the youngster to Stamford Bridge, it is considered as a plus for the club as the player is talented and also, other big clubs thinks highly of him and also want him to their side.